As South Africa’s unemployment rate increases, so will the need for more start-up companies—small business as such. However, even despite Government’s many efforts to address the issues the country’s SMMEs are grappling with on a daily basis, the SMME market still lacks the much needed guidance and support. Especially since the launch of the Ministry of Small Business Development, under leadership of Minister Lindiwe Zulu, there has been a renewed focus on this business sector which is currently in dire need of more attention. Organisations such as The Small Enterprise Development Agency (SEDA), the Small Enterprise Finance Agency (SEFA), the Centre for Small Business Promotion (CSBP) and the National Small Business Chamber (NSBC), to mention but a few, have in their own special ways been making headway, with efforts to help the many struggling small and medium businesses to raise their profiles to eventually become fully fledged and successful businesses that will eventually contribute to the economy. This despite the huge numbers knocking on their doors. Those in the know say one thing that is seriously hampering SMME development, is the lack of a unified voice. 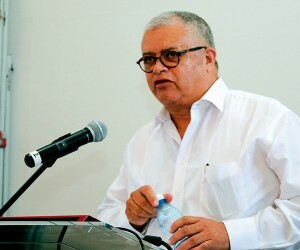 According the SME act, the Minister of Small Business must appoint an advisory council (the National Small Business Advisory Council to the Minister) and it has been confirmed that members in industry have already been nominated to make up this very important connection between the ministry and the SMME world. One such nominee is Carl Lotter, CEO of the South African Small and Medium Enterprises Federation (SASMEF). As a senior associate at the Africa Strategy Group, Lotter specialises in international trade and investments, corporate governance and government relations; providing strategic advisory to both business and governments. His many previous roles in South Africa and abroad included that of South Africa’s trade and development representative to Australia and the USA—hence his extensive international experience in the financial services, energy and water utilities, minerals and other strategic economic development sectors. Passionate about all issues relating to economic development, focusing on developing processes and practices to promote corporate governance and international best practices in business and government, Lotter, a humble man with both eyes on the ball, says the plight of SMMEs lies very close to is heart. Opportunity caught up with this insightful world-recognised leader, who shared his thoughts, ideas and visions on the SMME situation in the country, and SASMEF’s dedication to become a voice for all small businesses in SA, before leaving for Istanbul, where he was invited as a special guest to attend the SMEs for Humanity (#SME4H) side event at the first World Humanitarian Summit on Monday 23 May. According to Lotter, SASMEF is a national private social enterprise that develops a vibrant environment where IMSME’s are able to significantly contribute to a healthy economy. And the organisation strives to be the ‘Voice’ for SME/SMME’s to actively shape political and economic centres of power to promote and implement development-oriented policies that support growth and formalisation of informal, micro, small and medium enterprises. Lotter, whose academic achievements include being awarded the Hubert Humphrey Fellowship by the USA government, enabling him to further his studies at the Boston University School of Management, where he focused on finance and investments in developing countries, has recently also been selected to receive the Alumni Professional Development Grant to participate and present at the International Council for Small Business (ICSB) 2016 Conference, organised by the International Council for Small Business next month. He was one of only three Humphrey alumni from countries around the globe whose proposal was accepted for the spring 2016 round of the Alumni Professional Development awards. His extensive experience as a banker, diplomat, senior civil servant and entrepreneur, combined with being awarded the Harvard South African Fellowship which enabled him to attend Harvard University as a Senior Fellow attached to Elliott House, makes him the right man for the job. Lotter says SASMEF is the answer to the call by State of the Nation Address of former President Thabo Mbeki, which also echoes President Jacob Zuma’s recent request for the private sector to help government grow the economy and create jobs. “In the SONAS of Mbeki and recently of Presiden Zuma, they challenged the private sector to help government grow the economy and create jobs. In response to this call, and given my life experience as banker, diplomat senior civil servant and entrepreneur, I started SASMEF, as a platform for Government, big business and SMME to collaborate and boost the contribution of SMME to the economy. “Government and Big Business say that SMMEs clamor at their doors for help and they do not know to whom they should respond. They would prefer a body that represents them. The NDP also referred to the fragmentation in the SMME sector. To be heard and taken seriously, SMMEs have to collaborate into one voice,” says Lotter, who also attended the Harvard Business School’s Senior Executives Development program, after which he undertook an internship at Barclays Bank International Division in New York, USA. Lotter says it is sad that the chambers of commerce, especially those that have membership in the informal and rural environment such as the National African Federated Chamber of Commerce (NAFCOC) and the Foundation for African Business and Consumer Services (FABCOS)—excluding the city based formal chambers of commerce—have not delivered adequate services to SMMEs. “Economic development practitioners have limited impact and this is due to fragmentation, professional jealousy and vying for limited resources from Government, hence our very fragmented environment. But SASMEF, as a leading organisation and a voice that advances the interests of SMEs, has its own challenges, says Lotter. He alludes that these challenges can be overcome through financial and economic education, the bottom up approach and having accessible structures, especially in rural and informal settlements. “Government’s main job generally and for SMMEs via the SME Department, is to legislate, make policy and promulgate regulation. We are failing on all these accounts with respect to Government. National departments across the board do not take note of SMME in the planning and legislative agendas. Treasurer should provide the department with more funding to acquire better trained people. “Our SMME policy is sadly out of date with our peers in other countries. We need to convert SEDA and SEFA into PPP’s like was done in Brazil in the case of the organisation Sebrae. We need to elevate SMMEs way beyond party political rhetoric. “There has been no significance changes and or improvements over the past 21 years relating to SMMEs in SA. If there was, SMME would not have the high failure rate, and SMMEs would have contributed significantly to creation of jobs and wealth,” says Lotter. If quality, quantity and price is attractive, Lotter says there are massive exchange benefits to be obtained for the country. His advice is to improve the balance of payments, lower inflation, and lower interest rates. In his opinion all will be beneficial to sustainable SMMEs and the economy at large. According to Lotter big business in South Africa is sitting on about R450 billion cash assets—waiting for investments. And SMMEs should receive a part of that investment. He encourages big businesses to relook their risk and reward polices, relative to supply chain operation. “This must not be left to supply change managers, but it must be the duty of the executive director and overseen by the board of directors. It is too vital to have delegated this down the line. Banks need to change the interest. “Support SMME, especially neighborhood businesses. Government and big business should not beat up on SMME—consider the wilted flower; do you treat the flower, or do you change the environment for the plant to produce healthy blooms?” he concludes.